Karen villagers in the Pa-an Township area have managed to carve out a niche for themselves while stopping large construction companies from monopolizing the local quarrying business. According to villagers in the area since the government allowed residents to work the quarries in Pa-an Township, Karen State, local people are benefitting. Saw Kyaw Myint Naing, told to Karen News that there were now five rock producing camps, in Minekan, Kawtharsue, Tawpone, Naung Lone Valley and Lwannya. Saw Kyaw Myint Naing said the decision was made back in December 2012. Saw Kyaw Myint Naing said. Quarrying is proving a convenient way for the residents to work. Villagers who have cars get jobs transporting material and villagers who don’t own cars work separating rocks into pieces. Farmers are also receiving money from people wanting to quarry their lands. 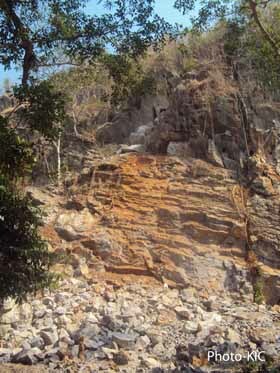 In previous years, big companies have tried to monopolize the Rock Mountains in Karen State for rock producing, but without success thanks to residents’ protests. The resident said that the government should provide investment loans and allow ethnic people to start businesses that would benefit residents. In Karen State, many villagers are needed to be manual laborers are needed for development projects including on industrial zones, building bridges and construction sites.